This week I have been in Palma de Mallorca to attend an event. Fortunately, fellow MVPs Paul Robichaux and Vasil Michev were also in town and we got to record an episode of the Office 365 Exposed podcast. Paul is editing the content and we should have it online soon. Stay tuned. One of the issues we discussed was the impending unsupported status for Exchange 2010, which I also covered in a Petri.com article. I think that Exchange 2010 was the most important release on a technical level because of its impact on Office 365. 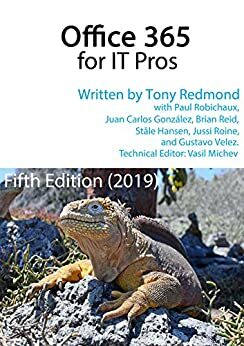 Others argued for Exchange 5.5 (too old to be considered), Exchange 2000 (the release that embraced Active Directory), and Exchange 2007 (the first to use PowerShell). All in all, I’m happy to stay with my position that the DAG, RBAC, Native Data Protection, and MRS were huge steps forward and make Exchange 2010 the champion of all releases. We also talked about the growing use of encryption in Office 365. Microsoft IT published an interesting case study about their use of the Azure Information Protection scanner to look for and protect sensitive content stored in on-premises repositories like file shares. It’s worth a read. The scanner can be expensive to deploy, but it’s much more effective than human checking of file shares and SharePoint on-premises libraries. Also in the world of Azure Information Protection (AIP), the latest client (1.41.51.0) protects PDFs using the industry standard. Microsoft updates the AIP client regularly and you need to keep an eye on what’s changed in each release. The development team runs a Yammer group that is open to all. You might like to join it. On the Teams front, some reports have come in to say that the Get-Team cmdlet isn’t working as well as it should. The symptom is that some teams don’t show up in PowerShell or the Graph but do in the Teams client, which is confusing. Microsoft is doing some background processing to update the properties of older teams to make them behave as they should. Apparently, the process will be complete soon! I’m sure that the folks working in DC were interested to read that Outlook mobile meets the needs of people with the highest Federal security and compliance requirements. Unfortunately, these folks seem to be limited to S/MIME instead of the rights-management based encryption available to other Office 365 customers. I guess some more work is needed to qualify this kind of encryption for government use. Outlook mobile can consume rights-management based protection today (in Microsoft terms, it is an “enlightened” client) and the Office 365 roadmap includes the ability for Outlook mobile to apply sensitivity labels in Q2 CY19. See this Petri.com article for more information on sensitivity labels. Stay tuned for an update for the Office 365 for IT Pros eBook next week. The writing team is working hard to update chapters and if all goes well, we should publish on January 21 and have updates available in EPUB, PDF, and Kindle formats available then.